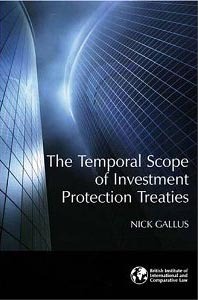 The Temporal Scope of Investment Protection Treaties addresses all aspects of investment protection treaty tribunals' temporal jurisdiction. Specifically, the book examines: the application of the temporal rule to investment protection treaties, including the aspect of the rule providing that a State cannot breach a treaty through acts occurring before the treaty comes into force; circumstances under which a State can breach a treaty through continuing or composite acts beginning before the treaty comes into force; the consequence of State acts after the treaty is signed but before it is ratified; time limits; and disputed arising before an investment protection treaty comes into force. The book draws from investment protection treaty decisions, as well as relevant decisions of other international tribunals, and is, therefore, not only a resource for investment protection treaty practitioners, arbitrators, academics and students, but also for those interested in the temporal jurisdiction of any international tribunal. "The Temporal Scope of Investment Protection Treaties"